WASHINGTON, DC — Washington Capitals goaltender Tomas Vokoun has been around for a long time. He’s played 13 seasons in the NHL and represented his native Czech Republic in numerous international matches. So when he said, “It’s been a long, long time since I felt I played as bad as I did today,” you know that covers an awful lot of games. Vokoun was the victim of some unlucky bounces, and probably a tactical error or two, but in the end a resurgent Caps offense — mainly from the bottom six forwards — bailed him out and persevered as the Caps knocked off the Tampa Bay Lightning 6-5 in a shootout before the 108th consecutive sellout at Verizon Center. Vokoun, making his debut for the Capitals after coach Bruce Boudreau opted to start Michal Neuvirth in the home opener, was decidedly not sharp for much of the game. 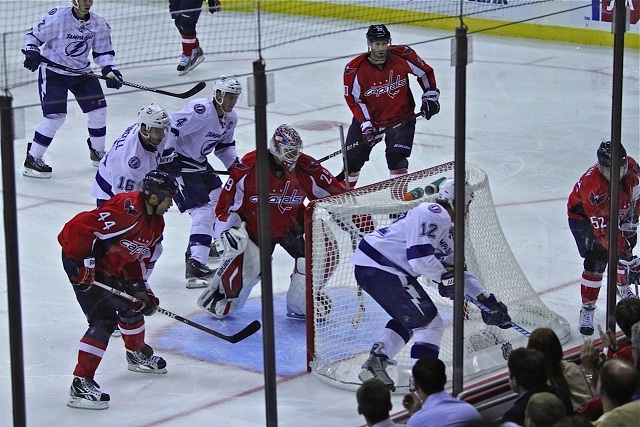 But he made five saves in overtime, three of which that could only be described as sparkling, and was not scored on in the shootout, and the Caps escaped the game with the extra point over division-rival Tampa. “It’s hard when you go first time in front of the home crowd,’ Vokoun said. “You want to do so well and then, things don’t go the way you like.” The Caps limited Tampa bay to just 28 shots total including overtime, but twice the Lightning scored from below the goal line, and three of Tampa’s five goals last hit a Caps player before going into the net. The Capitals received scoring from every line — except the top unit. 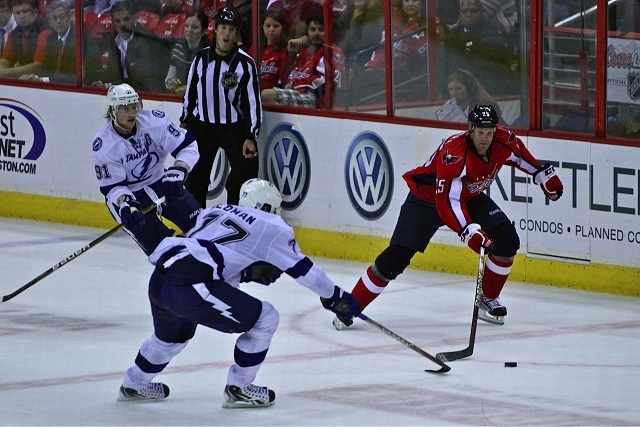 Jason Chimera tallied twice during regulation, with Marcus Johansson, Dennis Wideman and Troy Brouwer adding one apiece. Matt Hendricks originally was credited with Wideman’s goal on a great leaping screen in front of Lightning goalie Dwayne Roloson (38 saves on 43 shots) and later opened the shootout by beating Roloson with his now-patented kick-fake. 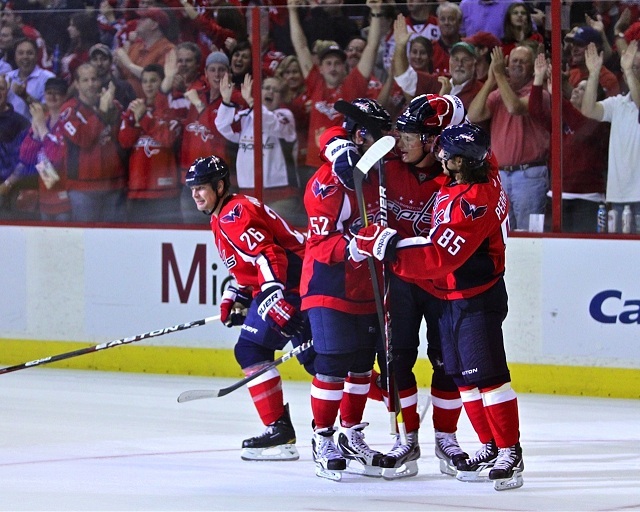 And Alexander Semin, who was second to Chimera for shots on goal with five, added the game-clinching goal in the shootout. The biggest disappointment, including the fluky goals against Vokoun, was the anemic power play. The Caps had no shortage of opportunity, but finished 0-for-7 skating with the extra man — and sometimes two — getting off 10 of their 32 shots with the advantage. At least the penalty kill came through, killing off all four Tampa tries, including two 3-on-4 situations in overtime. Two uneven performances has netted four points against two division rivals in the first two games, with plenty of places for the Caps to make adjustments and improvements. The Caps go right from the frying pan and into the fire Thursday against Pittsburgh, with everything that comes with that. It’s a tough test right out of the gate for a team still trying to find its legs. Worst game he’s played in a long long time and still comes through with a W, gotta like that. Who’s going to start up in Pittsburg? Any word? no word about goalie for Pittsburgh yet. team had a complete day off today with no media availability. we’ll post when we hear something.